The English Language Olympus Pen E-P2 12.3MP Micro Four Thirds Electronic Viewfinder Interchangeable-Lens Digital Camera user manual / operating instructions (Olympus calls it the “E-P2 Digital Camera Instruction Manual”) is now online and available for download at olympusamerica.com (right-click and save the user guide to your hard drive). If the download link didn’t work for you, go to the Product Support page for the E-P2 and manually locate the file “E-P2 Instruction Manual (English)”. 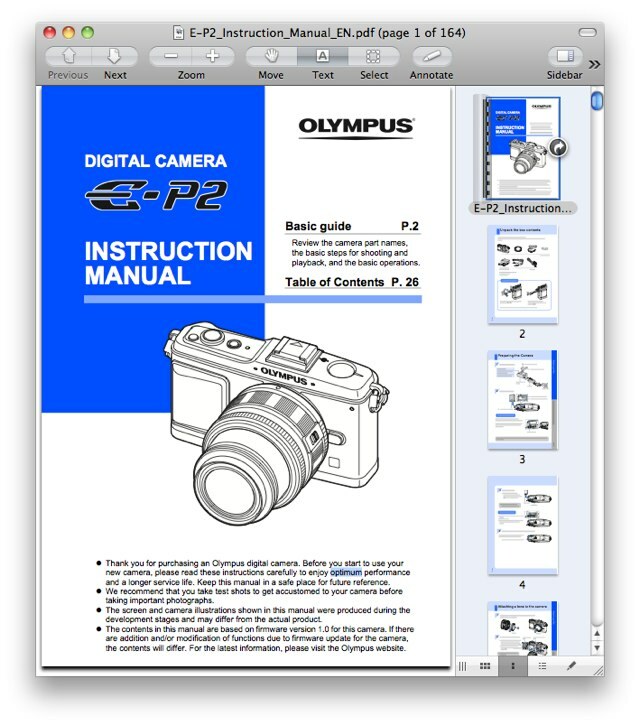 Unlike with Nikon, Olympus allows you to freely print the E-P2 owner’s handbook without building in any password protection into the PDF. The file size of 164-page Olympus E-P2 Adobe Acrobat PDF document is 14.6 MB (megabytes). The guide discusses the features of the E-P2 and how to use the camera. It also describes the use of, and camera settings for several optional accessories. One example is found on Page 61: Flash Shooting, where a table presents the functions available with various Olympus flash units such as FL-50R, FL-36R, FL-20, FS-RF11, TF-22 and the new FL-14. 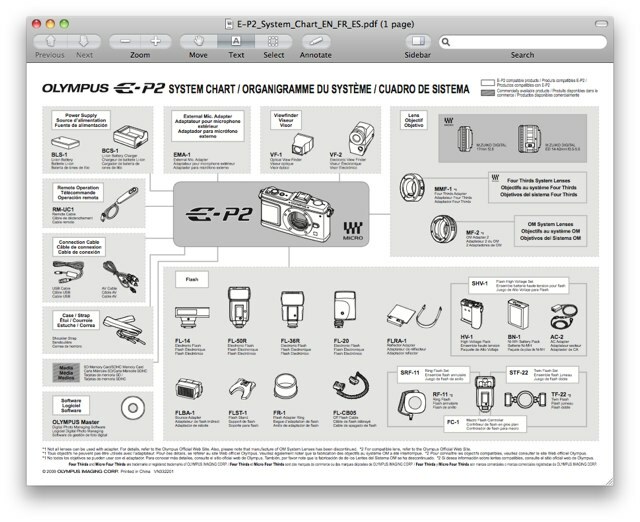 For a list of compatible accessories, download the Olympus E-P2 System Chart (1 page, 369 KB PDF document), which is also available at the same product support page as the instruction manual.